After our Jawbreaking experience at Zark's, we managed to save room for dessert and headed out to Mother's Crepe & Cafe in SM Mall of Asia. 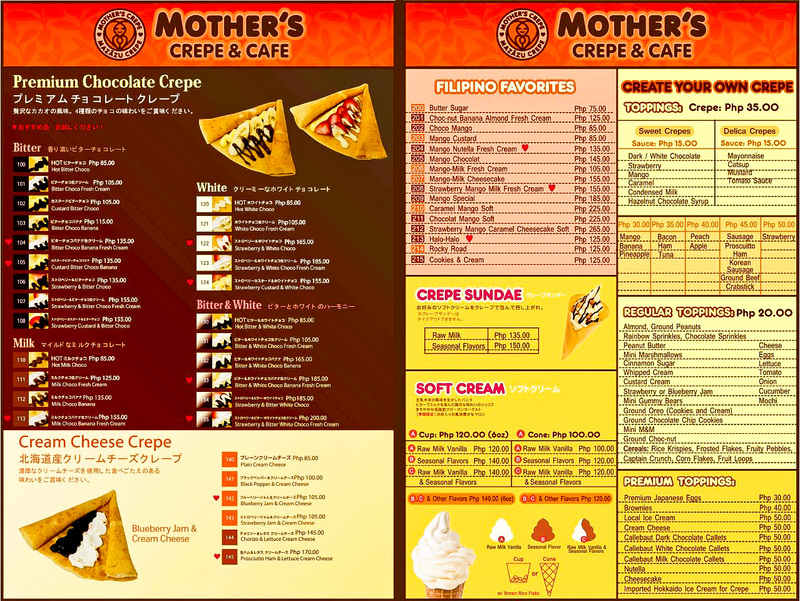 Mother's Crepe is a famous crepe chain in Japan that is also known as Mazazu Crepe in other countries. It currently has franchise stores in Hongkong, Singapore, China, Korea, Canada, Australia, Thailand and Saudi Arabia. 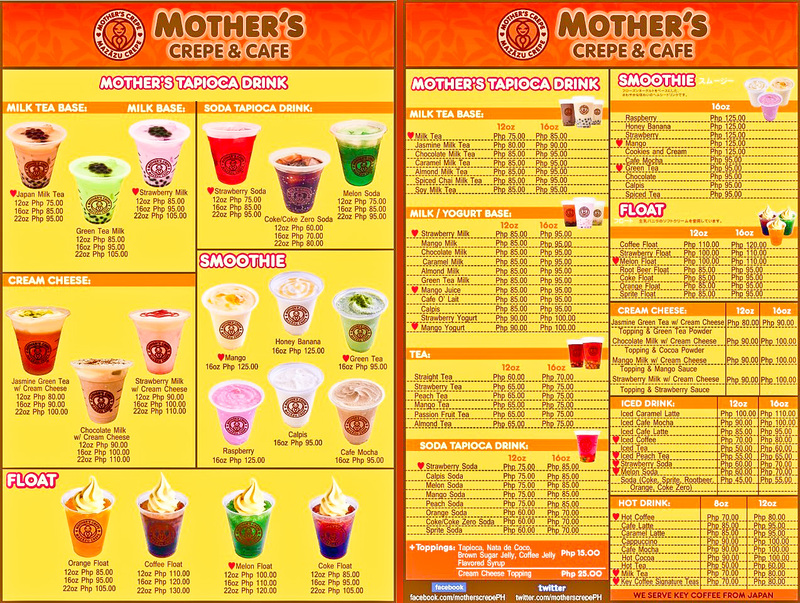 And now, Mother's Crepe has also landed in the Philippines to bring their delicious and healthy Japanese crepes to us. Located at the 2nd level of the Entertainment Mall near Chatime, a display of eye-catching and mouth-watering dessert crepes leave passers-by curious about this new found crepe haven. 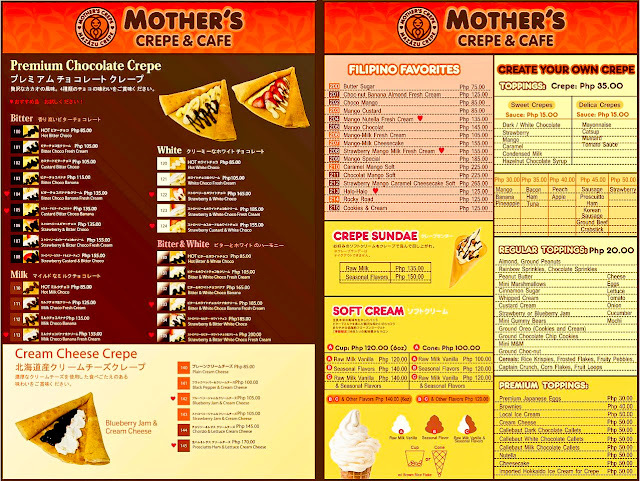 Mother's Crepe and Cafe occupies a small area that can accommodate just a small number of dine-in customers. It doesn't stop customers from trying out some of their crepes though as Mother's Crepe is also a dessert-on-the-go. 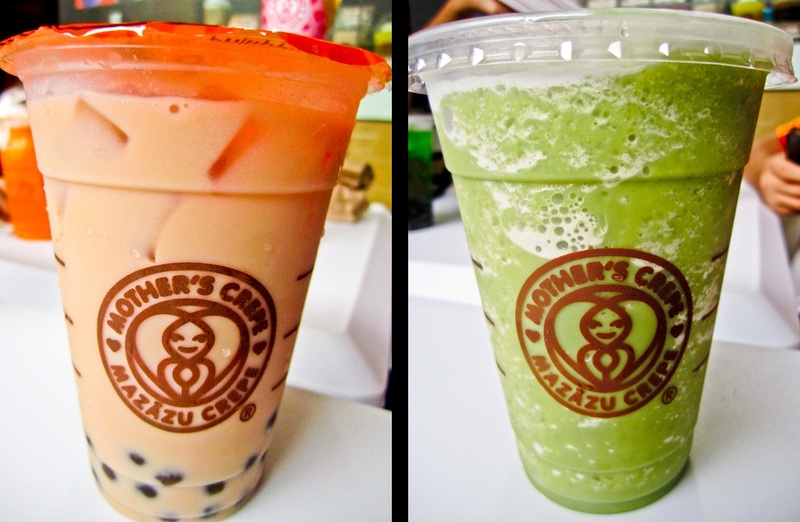 Mother's Crepe takes pride in using a propriety recipe for their crepe mixes and whip cream. Their crepes are made with flour mixed with bran which is a high source of dietary fiber. 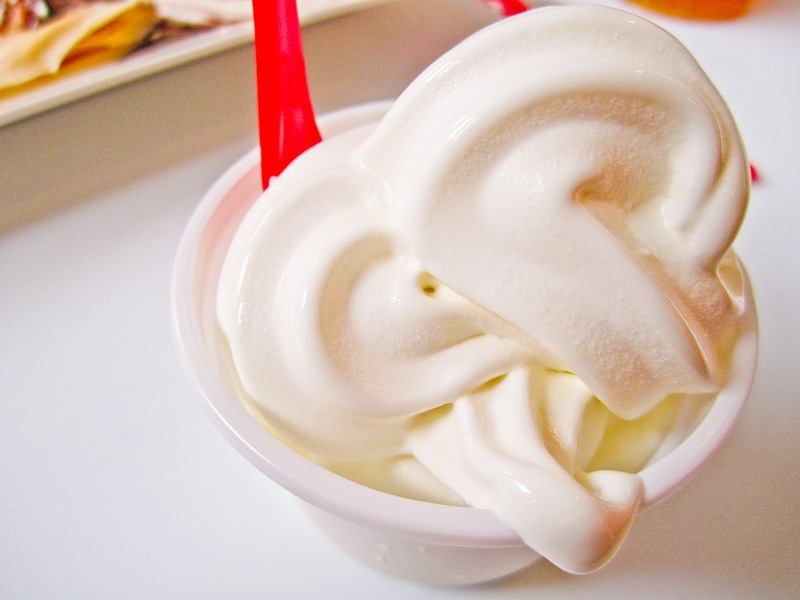 They are also conscious of the fact that whip cream has a very high fat content, so intensive research was done to come up with a light-tasting and low fat whip cream. It only contains 26% amount of fat content using pure vegetable fat hence making their whip cream low in cholesterol. Aside from their crepe mixes, they also use the finest and quality ingredients in every order. Using Driscoll's strawberries for some of their fruit crepes, you'll be sure to have a delighting and satisfying sweet treat. 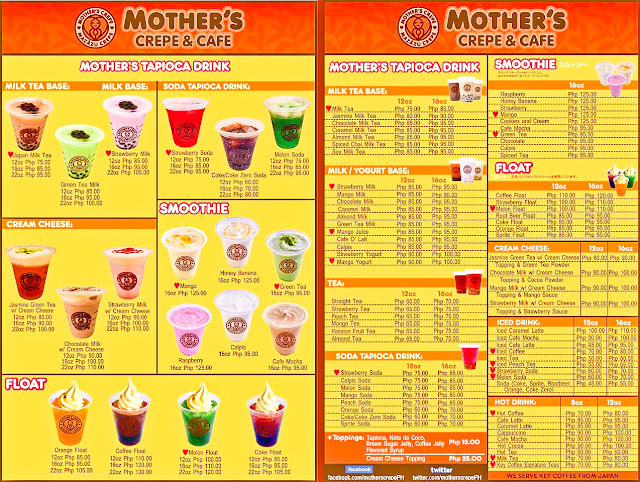 Mother's Crepe not only serves dessert crepes but also has a wide menu of beverages ranging from smoothies and milk teas to sodas and floats. With the wide selection of their menu, it was really hard for us to decide which flavors to choose. 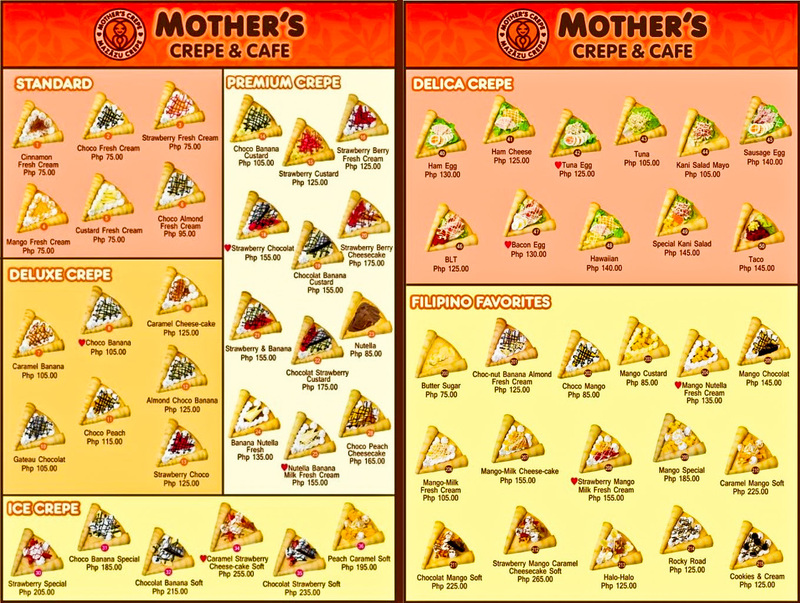 Lucky for us, Ms. Adeline Ong-Santiago, hands-on owner of Mother's Crepe, was very helpful in recommending some of their best-sellers and must-trys. Normally, an order of their crepes would be served in a cone, but if you are quite a messy eater, then asking your order to be plated is also very welcome. I would suggest dine-in customers to have their desserts plated as it looks more pleasing to the eye while enjoying your plate of Mazazu's crepes. For their Deluxe crepes, we got to try their Almond Choco Banana which is basically a mix of almond nuts, chocolate syrup and banana slices. These toppings never fail to make a great combination in any dessert recipe. 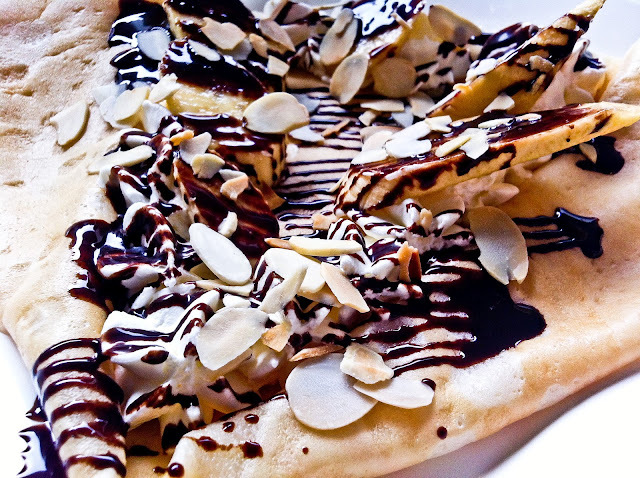 There were generous amount of almond and banana slices drizzled with the sweet chocolate syrup. Next we had their Ice Crepe which consist of raw milk vanilla ice cream inside. We got the Caramel Strawberry Cheesecake Soft, one of their must-try crepes that has a soft and fluffy cheesecake slice personally baked by Ms. Adeline. A visit to Mother's crepe definitely should include an order of their crepes with cheesecake. It is certainly one of the best cheesecakes I've tried. Taste was very cheesy and texture was light and smooth, just a little denser than chiffon. 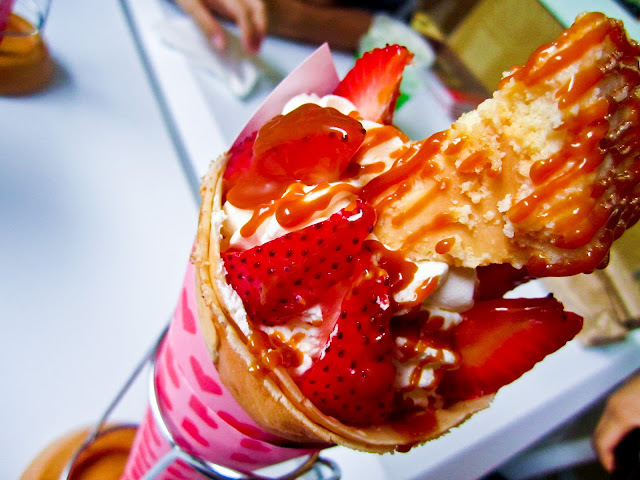 Though the look of this crepe seems to be overly sweet with the fresh strawberries, caramel syrup and the vanilla ice cream, nothing is too sweet for someone with sweet tooth cravings. Definitely a must-try! Another classic pair, Strawberry and Banana from their Premium Crepes is a cone of fruity freshness. Big slices of sweet strawberries and banana drizzled with chocolate syrup make this a fresh and light-tasting dessert. 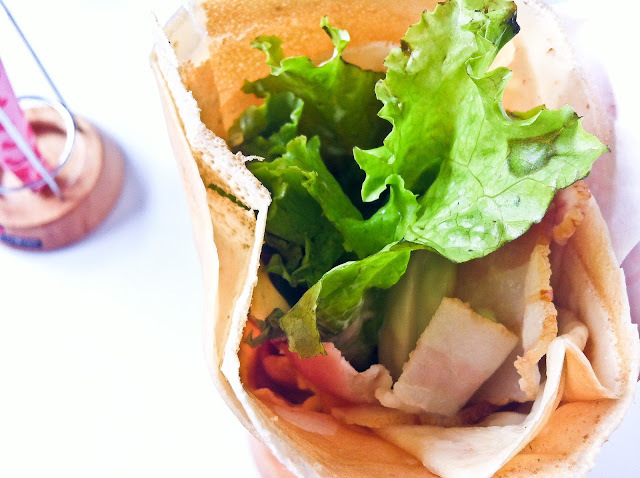 See those brown spots on the crepe, that's the bran fiber infused in each wrap for a nutritious and healthier treat. 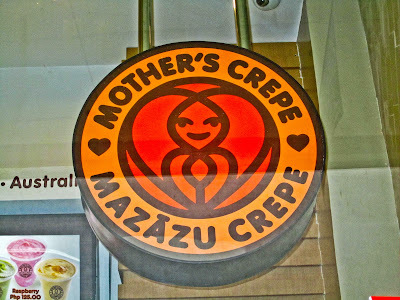 If you think that Mother's Crepe is all about desserts, then read further. 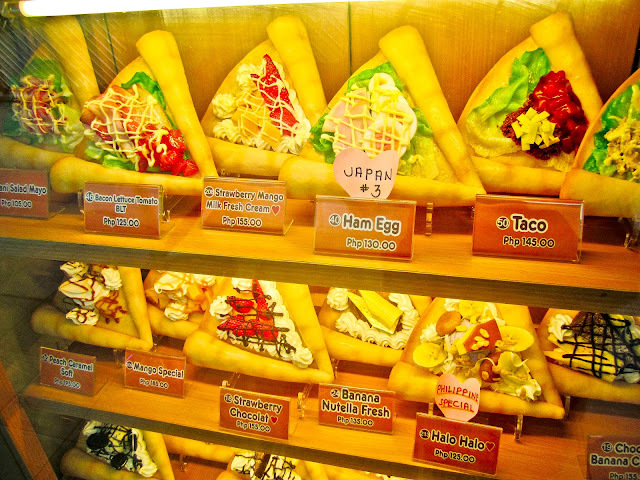 Mother's Crepe also has a line called Delica Crepes which consist of delightful sandwich flavors on a crepe. Their must-try is the classic sandwich pair, Bacon and Egg. Everybody would agree that everything's better with bacon, but what's more interesting about this crepe is the use of free-range eggs with golden-orange yolks. With the use of a Japanese technology, the eggs become creamier and tastier than our normal eggs. We also got to try their Hokkaido Raw Milk Vanilla on a cup that was sweet and creamy. We were able to taste the raw milk vanilla in their ice crepe previously making us a bit overwhelmed by another serving. Nevertheless, it was still a great tasting cup of soft-serve ice cream. Moving on, we got to sample a few of Mother's Crepe & Cafe's beverages too. 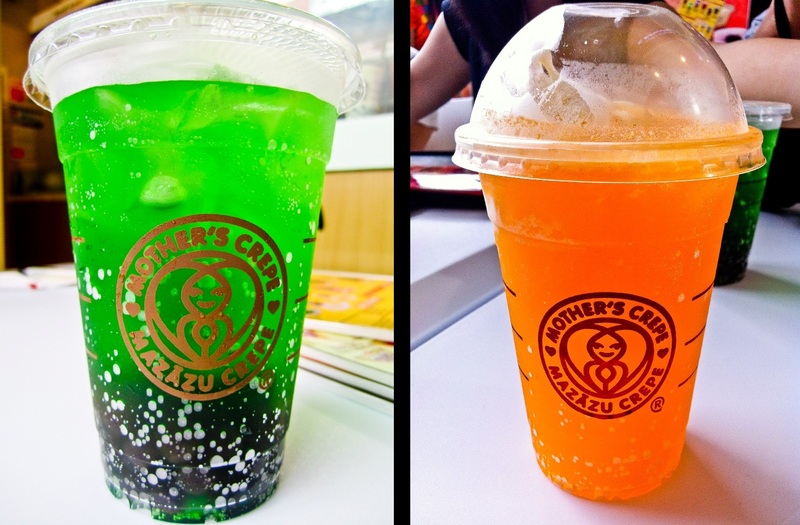 The Melon Soda and Orange Float were sparkling drinks that were both equally refreshing and thirst-quenching. The Melon Soda was a green colored melon drink with uberly soft and chewy tapioca pearls at the bottom, while the Orange Float comes with a raw milk vanilla ice cream on top. I found the Japan Milk Tea with Tapioca Pearls a little bland for my liking. It wasn't too sweet and has more of a milky taste with a faint tea flavor. The Green Tea Smoothie on the other hand had a more distinct tea taste which I like. It was blended perfectly to achieve a thick and smooth consistency. Tea drinkers, this cup is for you! A light and thin tasting of the aromatic jasmine tea is a great palate cleanser after all the sweets we've tried. 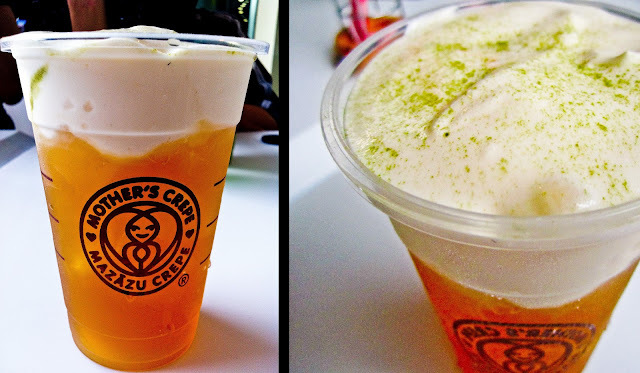 Topped with a cream cheese froth with a few dash of green tea powder, every sip gave a nice balance of earthy and clean flavors from the jasmine tea and the creamy and salty taste from the froth. With various dessert crepe cafes found in the Metro, Mother's Crepe takes pride in giving their customers the best quality and service. Using only the finest, freshest and quality ingredients to make their crepes and drinks, you'll be in for a delicious and healthy treat. With hands-on owners and friendly staff to assist you, you are sure to have a great Mother's Crepe experience in the Philippines. i think this would be a click ... since they have variation on crepe preparation ... thanks for sharing ... i must try this. Nice video. Made my mouth water as they prepared the crepes! Drooling now! The price isn't bad! Why I'm here now! I'm drooling tooo :( I want that. I hope there's a easy chinese meals to follow for Bacon and Egg. Yummy! crepes galore... so many possible mix and match.... wonderful! 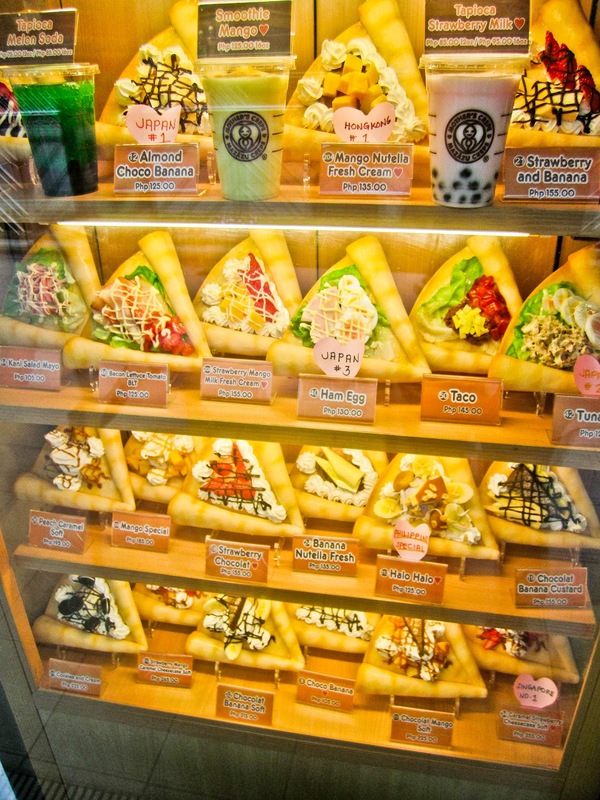 *drools* bigla ako nag-crave sa crepe and milk tea. anyway, is it a good combination? the crepe and milk tea? i haven't tried combining the two yet. I was there last Friday and I love all their crepes. Too bad I cant have them all. Wil visit them again! What the..... this post really made me crave for them all. Love the foods! love the shots of yours. all this crepes!!! makes me salivate! lol! Looks very sweet to me. 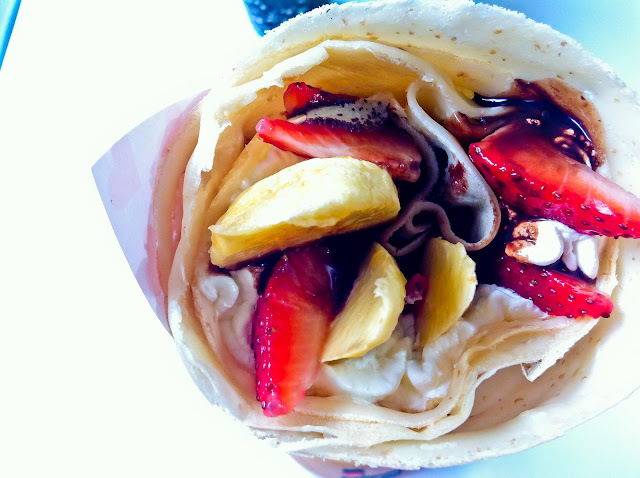 That Banana Strawberry Crepe looks enticing! Even though it is raining i want that banana strawberry crepe! Looks so yummy and sweet! I like the fact that they have those plastic displays on the window. Gives you a better idea of what is in the crepes. wow! a must try! nom nom nom..
I’m not that much οf a onlіne reaԁеr tо bе honest but уour blogs really nіce, κeep іt up! 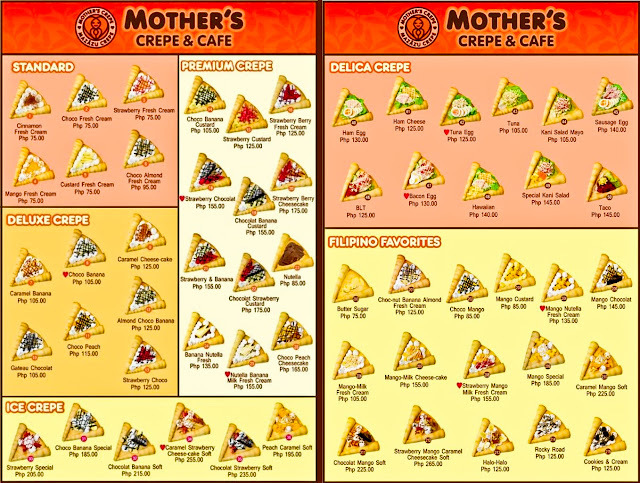 kindly, could someone advice me where to look for a contact address or official website for the mother crepe, because i want to open this business in UAE so i was thinking to get the franchise and open it here or atleast get few professional crepe makers who could make this business success.